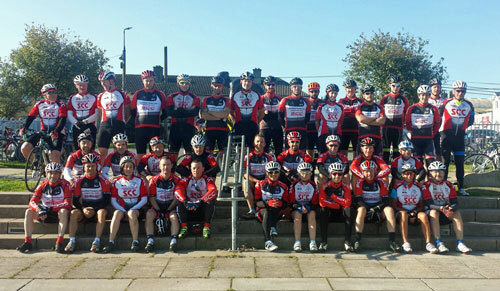 Slaney Cycling Club is a friendly Enniscorthy based club catering for racing and leisure cyclists of all disciplines. Formed in 1974 its members have competed locally and nationally ever since. Originally a mainly touring club, many members now compete in time trialing and road racing as well as leisure events. With weekly tours every Saturday and Sunday morning and informal spins and training sessions during the week along with a growing racing calendar, the club has a very active membership. Most members come from around the Enniscorthy area but the club also has members further afield who keep in touch regularly through the club website. Slaney Cycling Club is affiliated to ‘Cycling Ireland’ the governing body of all cycling in Ireland. The club actively promotes cycling as a healthy, sociable sport suitable for all age groups. During the past 30 years the club has been to the fore in organizing local and national cycling events. We currently have very active racing and touring groups within the club. The club has developed an excellent relationship with the local Gardai, town council and county council while undertaking large scale events such as The Ras, the national championships and of course our involvement in the 1998 Tour de France stage start. In 2006 we were host town for stage 1 of the FBD RAS and held our first Cyclo Sportif event, the Mount Leinster Challenge which has since become one of Ireland’s most popular leisure events. The club caters for cyclists of all categories, with senior, veteran, junior and lady members. The Club is involved in regular inter club races along with the other clubs in the region. All Slaney members who hold a Cycling Ireland race licence are eligible for inter club events which take place between March and September. Most events are handicapped – offering an excellent introduction to racing for new members, and tougher races for more experienced riders. Some members compete in a full calendar of national events. Since 2005 we have entered teams the Gorey 3 Day race. Our consistently highest ranked rider Frank Dunne achieved Category 1 status in 2005 and has competed in the international FBD RAS 8 day stage race on several occasions. The club always welcomes new members. We especially welcome riders from 16 years old upwards or under 16 along a parent/guardian. We also have a great ladies group up and running who are always looking for new members to join them on their spins. If you want to join or if you have any queries/ questions, please contact us or if you would like to find out more about us feel free to browse the rest of this site or go to the contacts page and drop us a line. Our aims are twofold. To be the top multi-discipline cycling club in Wexford and also to encourage more people to take up cycling in the South East. So get that bike out of the shed and come out and join us! Slaney CC meet at the Tour de France monument at the Duffry car park, opposite Pettits supermarket every Sunday morning at 9.30am sharp for a 2 hour(ish) spin ! Led by tour captains Mylie Kavanagh and John Butler, we try to get 35-45 miles in, weather permitting. Riders can cover all or part of the tour depending on ability. Not many cycling clubs can claim to be involved in the planning and organisation of the worlds greatest cycle race – and have the event captured in a TV documentary. Slaney can! 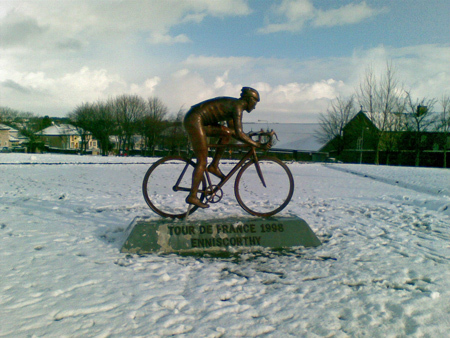 Ireland played host to the world famous Tour De France in July 1998. The build up was captured in an absorbing documentary that depicts the tours “travelling circus” descending on Enniscorthy, Co. Wexford as 3,000 pike-wielding locals re-enacted the 1798 uprising against the British Government. The Pikes and Bikes story begins 4 weeks before the Tour arrived in Enniscorthy and follows through to the day of the race, with characters ranging from local officials, beauty queens, national organisers, local cycling fans, pikemen and women, and visitors from all over the world. We would like to thank our sponsors Nolan Transport for all their assistance and support.